I did not think a lot before booking this ticket. I had a cursory glance at a couple of online bus ticketing portals and then headed to the KSRTC website to look for options. I found only one AC bus listed there - that was an AC Sleeper. A Corona Majestik Sleeper bus!! Its been a few years since I travelled in one, and did not think further - just went ahead and selected a single lower berth. I had to be content with Berth #10 - in the 4th cabin, somewhat around the rear axle. The booking process was simple, as usual, and the mTicket popped up in no time. I checked out of my hotel room well in advance for my bus, which would depart from Kalaburagi Central Bus Station at 1930hrs. I reached the bus station over an hour before the scheduled departure of my bus - the bus station was fairly big, and had lots of waiting area. The PA system was continuously announcing departures to various areas in and around Karnataka. I had some snacks and stocked up some water for the journey ahead. 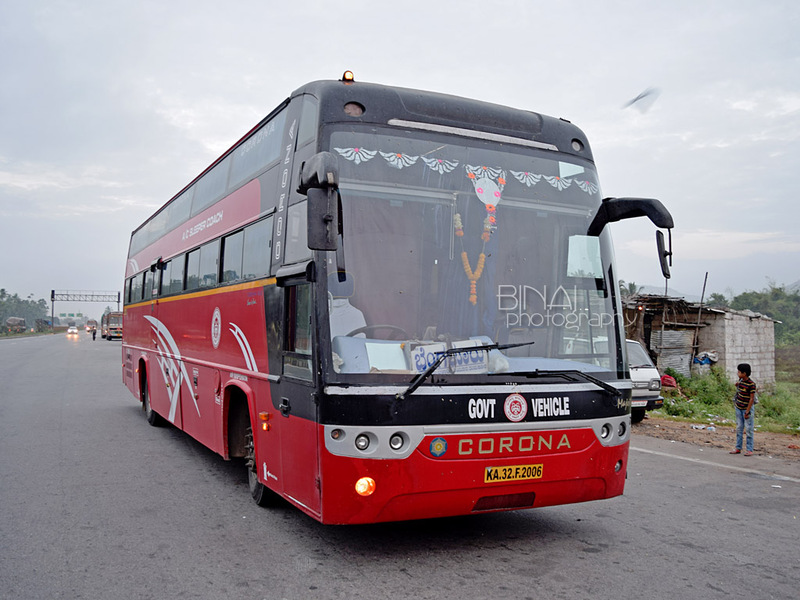 A Corona Sleeper bus came into the bus station around 1915hrs, and parked at the Bangalore Platform. The board on the bus read "Bangalore" as well. I confirmed with the crew that this would indeed be my ride to Bangalore. I received an SMS with the bus and crew details a while after the bus arrived, and the message confirmed that my bus would be KA-32-F-2006. It was a red coloured Corona Majestik bus, delivered to NEKRTC in October 2014. Boarding started soon after the SMS arrived. I got into the bus and occupied by berth (#10, a single lower berth in the 4th row). The bus was stuffy inside since the AC was off. The lower berth was slightly above the floor level - there was enough space under the berth to leave a laptop bag and footwear. The berth was sufficiently wide enough, as well. A pillow, a small bedsheet and a blanket was kept on the berth. The engine was switched on about 5 minutes before departure - the engine was noisy, and there was a lot of clatter. The bus started off at 1938hrs - after getting some more passengers on board. There was a delay of 8 minutes at start. Soon after starting, the conductor came around and checked if anybody was yet to get bedsheets or blankets, and also distributed water bottles. I was too tired to remain awake - so just set my berth and got set to sleep until we stopped for dinner. We stopped at Jewargi (2023hrs) to pick-up a couple of passengers. I slept fairly well, and woke up just as the bus pulled into a dhaba (a motel) for dinner. The time was 2110hrs, and we were at a place called Hill Town Dhaba, just past Shahapur. The dhaba looked like the typical cut-throat road-side place. They served some really finger-lickin' delicious cashew masala - with cruchy, but adequately cooked full cashews in a thick onion gravy, along with soft Chapatis. I was expecting a 5-star bill - but that didn't happen. My eyes popped out when I heard the bill amount - it was far cheaper than the place I take my lunch daily! It took me some time to get over that shock. I was just standing outside the bus, when the driver came around and asked me politely to get into the bus. He did that with all the passengers standing outside. We finally started off from there at 2139hrs. I had a very nice sleep after dinner. I vaguely remember waking up in between - the bus stopped quite often for tea breaks. They did not switch off the engine or the airconditioner during these breaks. The AC was quite effective, and kept the interiors quite cool. I slept until around 6AM. The bus stopped for another tea break at the toll gate right after Tumkur (0639hrs). I took a walk outside, and took some pics during the break. We were quite late already. The tea break was quick. The driver was quite fast - he maintained pace after the break. The bus appeared quite underpowered and gearing was poor. Even with all that, the bus was able to hit good speeds, and maintain speeds consistently. The bus took the elevated highway after Parle factory, and we made it to Yeswantpur by 0741hrs. Traffic was low, thanks to it being early morning on a Saturday. We reached Navarang by 0745hrs. Passengers were getting off at every stop on the way. I was finally dropped outside Bangalore City Railway Station (Majestic Bus Station) at 0758hrs - 28 minutes late! The overall ride was very comfortable. The end-to-end run time turned out to 12h20m, for a distance of about 620kms. I understand its not a full 4-lane carriageway, and the road was uneven at places. Uneven would be an understatement - it was pothole ridden at places. The rear suspension was quite soft. Full air-suspension surely was helpful. The engine was loud and clear at my berth - the clatter was quite evident. Thankfully, heat wasn't penetrating into the coach around my berth - but I guess it was getting hot at the rear berths. The front berths were dead silent - I'd surely try a berth towards the front next time. Except the noise, it was a great ride. The berth was sufficiently wide for my extra-large frame. The interiors were kept really clean as well. Will I take this service again? I am not a regular to that side of Karnataka. But I'd surely like to try a Corona Sleeper again. 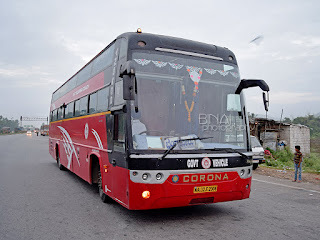 Perhaps you can try the KSRTC Corona Sleeper (old ones) plying between Bangalore-Thrissur and Bangalore-Ernakulam!I travelled it in once and was really pissed off with the punctuality! !